The valley is at an altitude of less than 500 feet, and is hot, even in September. It was over 100 Wednesday afternoon when we drove in from LAX, but the palms were lush and there seemed to be no water shortage in this area. Thursday morning, we drove west from Indio to Palm Springs, went up the access road to the tram. It climbs to 2600′ in 2.5 miles. The Tram then goes up to 8500′ in about 10 minutes, taking you to the mountain forest from the desert, and dropping about 30 degrees F. We decided to head toward San Jacinto Peak, which is 5.5 miles (11 mile round trip) from the tram, and at an elevation of 10,834′. The trail goes through a beautiful forest, on the way to the peak. 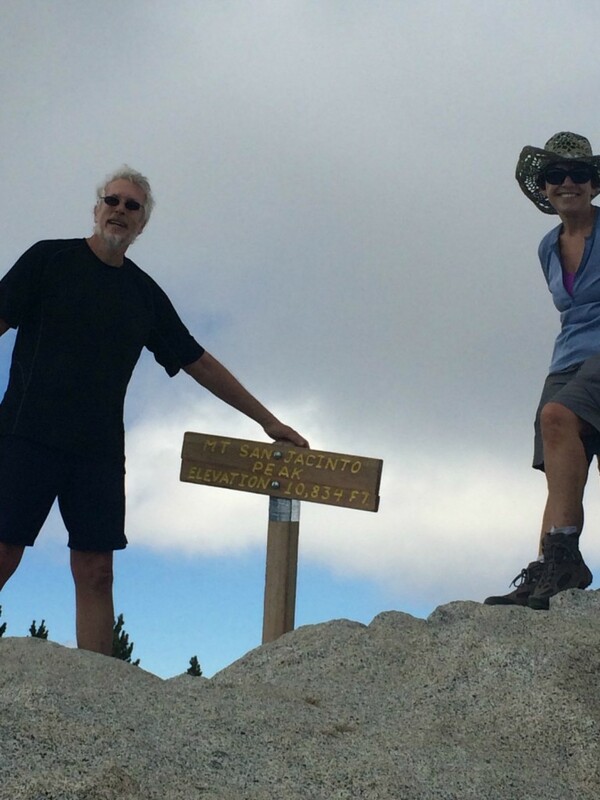 The summit is a rocky boulder pile, but it did have a picture-worthy sign. However, the views are fantastic. The peak is over 10,000′ higher than the valley, a perspective you don’t often get except from a plane. Friday, we headed 25 miles east from Indio to Joshua Tree National Park. 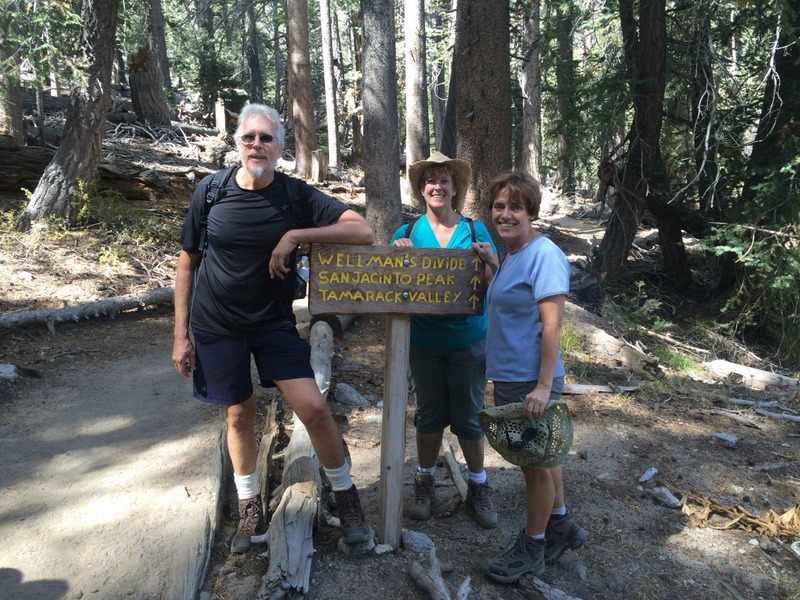 We’d been advised (by folks we met on the summit of San Jacinto!) to start on the south end by I10, and drive across the park to experience the changes in the terrain and ecosystems. You start in the Sonoran Desert zone near I10, hot, with creosote bushes as the dominant flora on the valley floors. The road crosses the Pinto Flat and begins to climb. 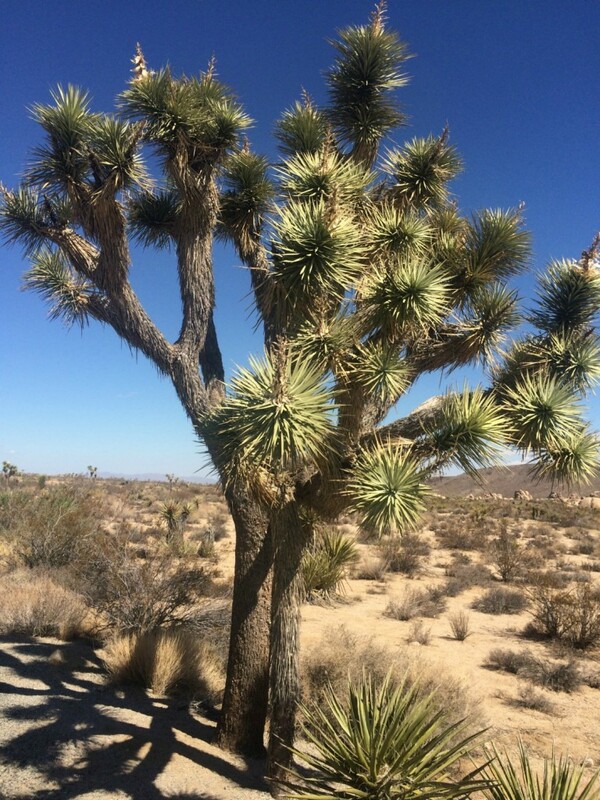 As it gets higher and cooler, you pass into the Mojave Desert zone, and the vegetation starts to change, with the eponymous Joshua Tree (a species of yucca) as the indicator species. There is a huge variety of plant life and varied topography in Joshua Tree NP, and the recommendation to drive across is a great one. 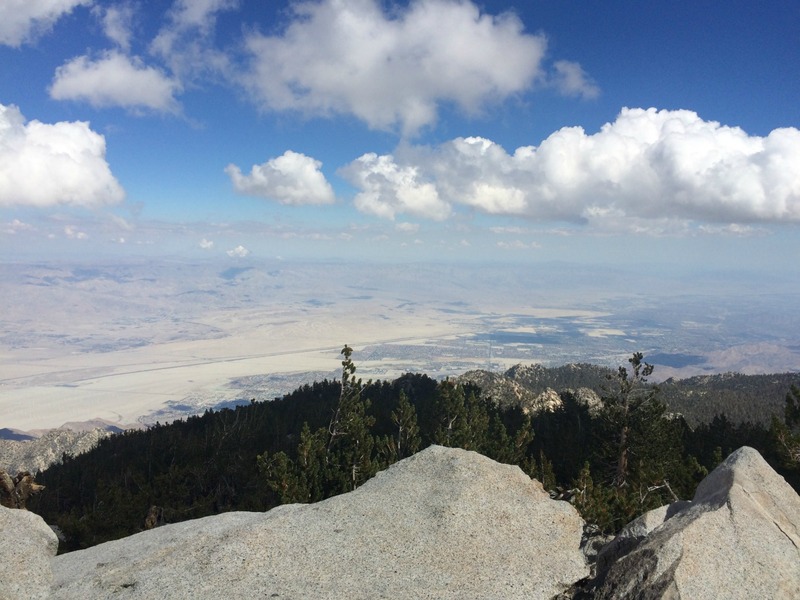 We stopped at Key View, an overlook of the Coachella Valley from approximately 5000′. We hiked up Ryan Mountain, at 5400′ the highest in the park. Ryan Mountain is a stout 3 mile round trip hike, gaining about 1000′ from the trailhead, but it affords a 360 degree view. Saturday, we said good-bye to the Coachella Valley, and headed up CA74 out of Palm Desert into the Santa Rosa mountains, through the Anza Valley, and to Temecula. The drive up CA74 is spectacular, as the road goes through so many hairpin turns you can’t count. If you drive this way, be sure to stop at the overlooks and marvel at the way the road winds back on itself. We arrived in Temecula around noon, and found that they were having a street festival and a massive traffic jam! We managed to get through and headed to the wine country. There are so many wineries clustered near Temecula, it’s amazing…at least 25 or so in just a few miles on Rancho California Road. We hardly knew where to start 😉 . Some are very big, and others are much more intimate. The first one we really liked was Weins, and if you go, I’d recommend it. Fantastic wines, and a very relaxing, friendly tasting room. We tried several others, but the first was the best! 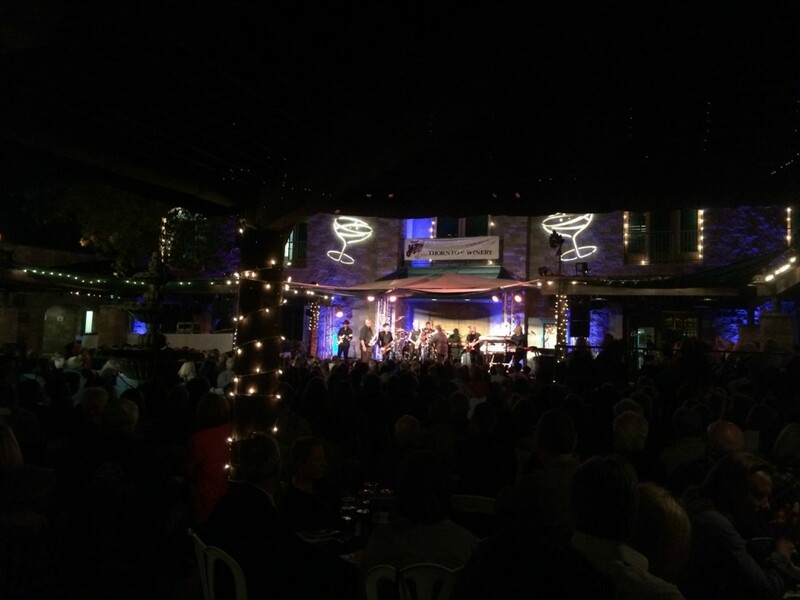 We ended our day at Thornton Winery for dinner and the Summer Horns concert. Our dinner table was in the center front of the dining area, but we’d hoped to be a bit closer to the stage. However, we realized that the owner’s table was next to ours, and we didn’t feel so bad 😉 . The concert was great, though the dinner itself was just average. They do have a Nebbiolo that was outstanding, though! After the concert, we headed a bit up the interstate toward LA, found a motel and stayed a short night, before we headed to LAX to catch the return flight to RDU. A great trip, and learned a lot about this part of southern California. This entry was posted in Family, Wine on October 5, 2014 by joel. What a nice day! Although this is “spring forward” weekend with an hour less sleep, today has been full of blue skies, warm temperatures and light winds. Ran a couple errands, then took the dogs to the creek. 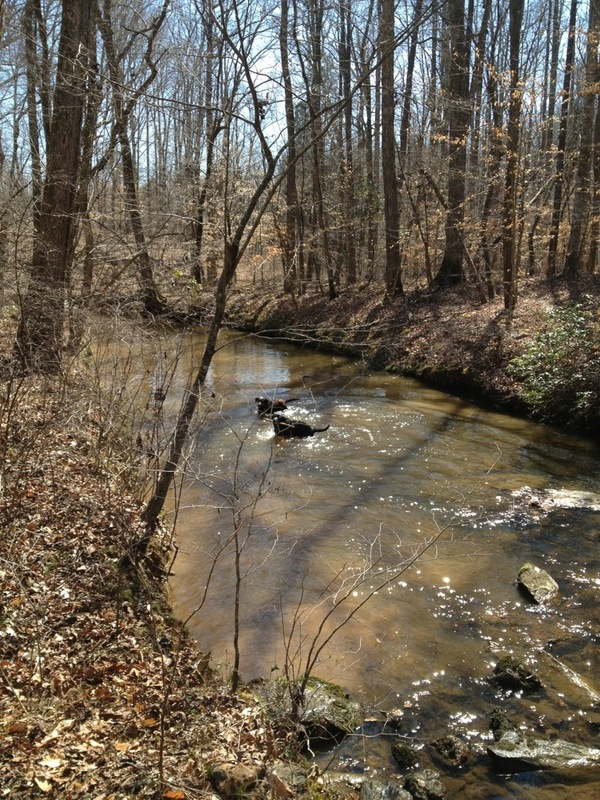 It’s hard to see any person or animal happier than a lab running thru the woods along a creek. This entry was posted in Family, Wine on March 10, 2013 by joel. This entry was posted in Technology, Wine on March 8, 2013 by joel. Well, not at the coast, but yesterday (5/25) at Jordan Lake. Got the boat and operational for the season. Took a new battery, the old one wouldn’t keep a charge. Loaded up the boat, put the dogs in the back of the Yukon, and Jan & I headed to the Fearrington Point ramps. Started up the boat, and nosed out into the lake. Great to see water in the lake, after last year’s drought. Jordan is still about a foot over normal pool. We headed about 3 miles down the lake to our favorite little “beach”…a small area of pretty, white sand under the pine trees. We got out the chaise lounges, the Sunday NY Times, and got set to relax. The dogs (labs) wanted anything thrown to them for retrieval…and soon! We had a frisbee, a foxtail, and a tennis ball with a Chuckit (this is one of those things that you say, why couldn’t I have developed that?). It’s impossible to wear out a 3 year old lab (Lessa), but we tried. Even the old dog, Anakin, who’s pushing 13, was swimming eagerly after the toys. Finally, a chance to sit down in the chaise and soak up some sun. A glass of cold pinot grigio? Of course! Grabbed it from the cooler, along with two wine glasses. Ah, the life! This entry was posted in Boating, Family, Wine on May 26, 2008 by joel. I don’t get out to fish as much as I’d like, but I did get a chance to wet a line today (even if I did spend an hour on a conference call while driving home). 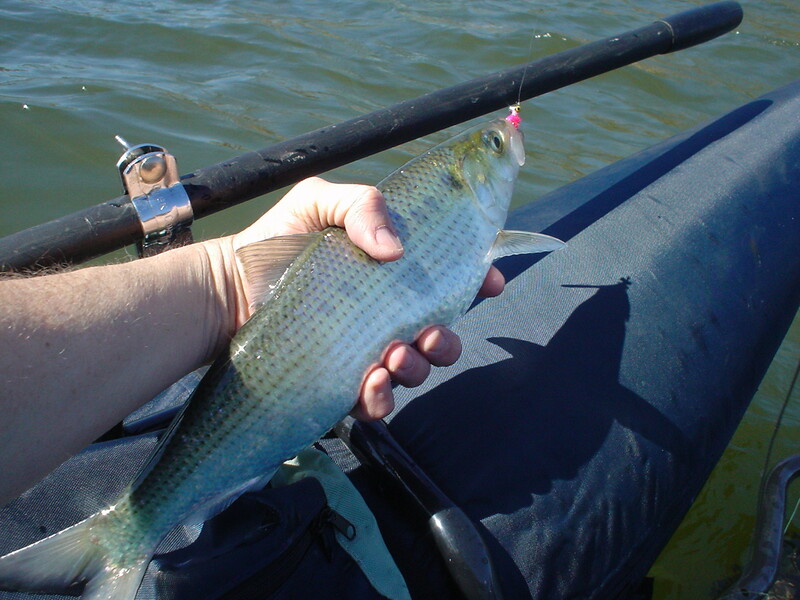 In March, Hickory Shad (an anadromous fish that comes up the rivers to spawn) fill many rivers in eastern North Carolina. The Roanoke River has a large run, and the fish move upstream until blocked by the dam at Roanoke Rapids Lake. They are great fun to catch, concentrating in large numbers and providing acrobatic fights on light tackle. I drove from Chapel Hill to Weldon, about 110 miles. I got to the Weldon ramp about 10:30AM. The wind was really howling, since a cold front came through during the night. The temperature was in the 50’s and the sun was bright, and the water level was perfect. Without the wind, conditions would have been ideal. As it was, casting was quite a challenge, as was staying anchored in my one-man pontoon boat, as the wind was swirling me around my anchor, making it difficult to cast in a consistent direction. However, the fish were there! I caught a few, then it slowed down. I realized that I was not getting my fly deep enough, even with nickel eyes and a sink tip line. I finally got the boat stabilized, and started catching them again. Caught about 25 or so, and about 2:30PM decided that casting a heavy fly into the wind was a lot of work. Rowed across the river to the ramp, loaded up, and headed for home. A great day! Stopped by the wine store on the way home to pick up an Aussie mixed case; will open one up shortly! 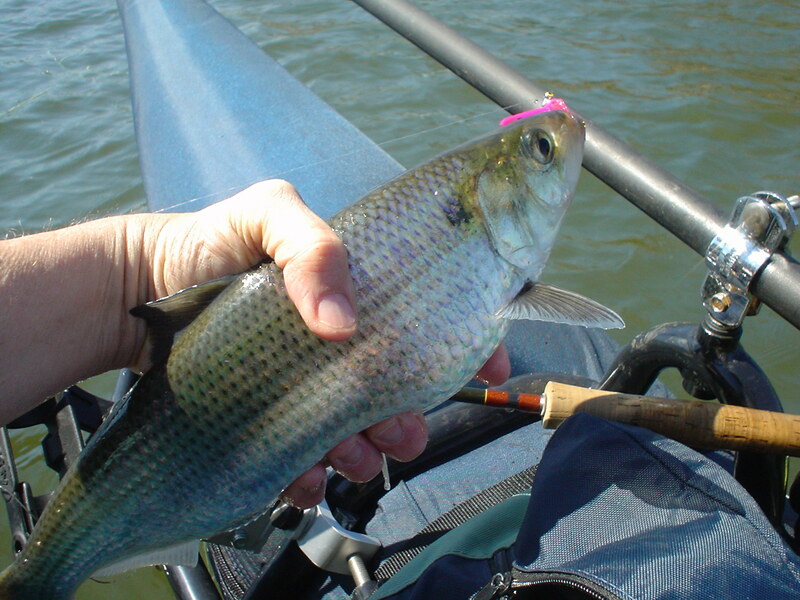 This entry was posted in Flyfishing, Wine on March 20, 2008 by joel. This year for Valentine’s Day, Jan and I did something a bit different. Our friends Nancy & Andy Zeman own a vineyard & winery near Saxapahaw NC called Benjamin Vineyards & Winery. They had organized a catered dinner at the winery for Valentines Day. They moved the casks of wine over to the walls, brought in some tables, and had a catered dinner for 11 couples. Nicely catered, each course featured one of their wines. They have some very good wines, including an excellent Cabernet (the Barrel Reserve 2005 – about 2 years on oak in once-used French Oak barrels). This one was a silver medal winner at the NC State Fair, and to my taste stands up very well with other Cabs in the $15-$20 price range. Nice texture and good tannins. One of the dessert courses was a Sorbet made with their blackberry-flavored muscadine wine, Blackberry Bramble. Very nice! Our next door neighbors went along with us for the evening, and it was nice to have good friends for conversations. If you are in central NC or are traveling through, I’d recommend a stop at Benjamin Vineyards & Winery, 12.5 miles south of I-85 at exit 154. This entry was posted in Family, Wine on February 16, 2008 by joel. Jan and I got away for a short vacation last week. We spent three nights in a B&B in Washington, Virginia, right next to the Shenandoah National Park. We stayed at the Heritage House B&B, a great place. Had dinner at the Inn at Little Washington, which was quite an experience. We hiked Old Rag, hiked White Oak Canyon, and watched the deer in the fields behind the B&B, visited wineries. Took my flyrod and fished a bit in White Oak Canyon. Saw some beautiful brookies, but wow, they were spooky. Didn’t hook one. This entry was posted in Family, Flyfishing, Wine on July 25, 2007 by joel. …that today is my 26th wedding anniversary! My wife Jan has done a great job putting up with me for all these years! Went out to dinner, had a nice bottle of wine. This entry was posted in Family, Wine on May 16, 2007 by joel. This entry was posted in Family, Virginia Tech, Wine on April 15, 2007 by joel. Opened a bottle of Moet at midnight last night, but only wanted a glass for each of us. I put a “vacu-vin” stopper in the bottle, pumped out the air, and then put the champagne top (the little metal cap with the wires under the bottle rim) back on over the vacu-vin cap. Opened the bottle about 2PM today and and Jan & I finished the bottle, sitting on the front porch…just as fresh and bubbly as when first opened. Maybe this is old hat to everyone, but it was news to me. This entry was posted in Wine on January 1, 2007 by joel.